Birthday time is round the bend! In the past, for reasons all my own, I have not liked birthdays. However, I have had some really great ones! 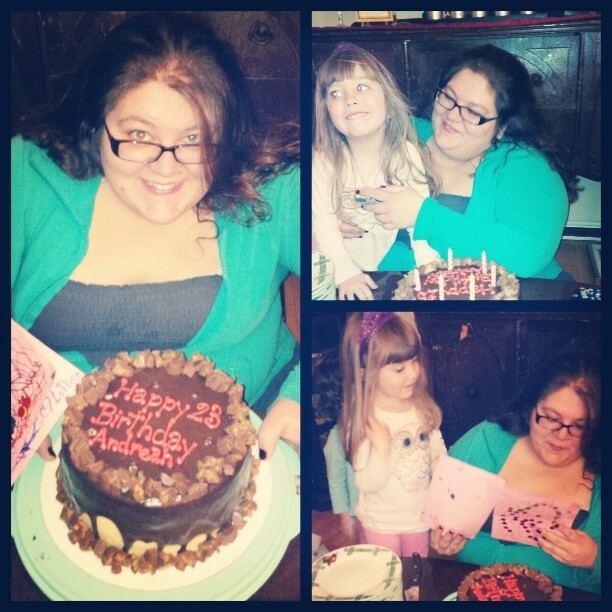 So here are my TOP three birthdays!!! Julia, Toni, Jacqui, and I believe our other ‘sister’ Becky took me out; it was one of the first times! We had a steak dinner, I got a virgin frozen daiquiri, and then we went to the movies. We all got dressed up and it was fantastic! I have no recollection of the movie, just that it was the first birthday that I loved. I was in college at this time and away for my birthday day. My darling friend Kate arranged a pub-crawl. I got sang to by a street full of random people, we sang Bohemian Rhapsody on the bus on the way to downtown London, and I got some boys in a band to sing me several Beatles songs! I was also really drunk for the very first time in my life and all thanks to a great group of friends and seven bars. I had just moved away to Peterborough, had a small get together with Joe’s wonderful aunts, and then got home just in time for a small birthday celebration with my family. Kim made an amazing cake, which I had seen on Facebook earlier in the day, but did not put two and two together. My mom and sisters set this one up, and it was definitely one of the greats. I didn’t think I would even be able to come home for my birthday last year, so the fact that I got even a small celebration with the people I love was amazing. This year, I hope, will be another great! I want to add more to my list! I can’t wait to celebrate it with the sisterhood, friends, and adopted family!